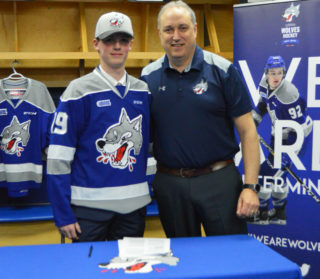 The Wolves wrapped up their double-header weekend at home on Sunday afternoon against the Ottawa 67’s who were making their only appearance of the season in the Nickel City. 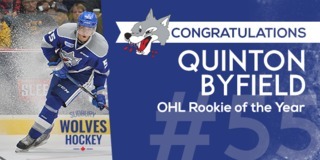 The afternoon match-up did not go as planned for the Sudbury Wolves as they fell to the Ottawa 67’s by a 6-2 final. The Wolves got off to a speedy start as MACAULEY CARSON opened the scoring 57 seconds into the game after he tapped home his own rebound. 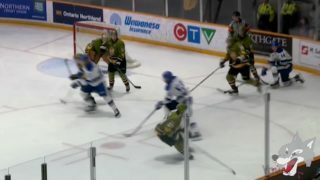 The 67’s tied things up on a seemingly harmless play put the 67’s on the board as NOEL HOEFENMAYER released a quick shot from the blueline after a face-off win. ZACK BOWMAN made an unbelievable stop shortly after the goal to keep the game tied. The 67’s capitalized on the powerplay as AUSTEN KEATING scored to give Ottawa the lead. A brawl broke out just after the goal with C.J. 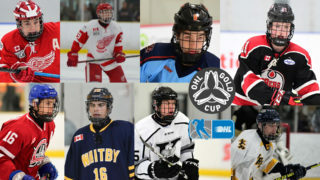 YAKIMOWICZ and CARSON both getting involved with Ottawa players. 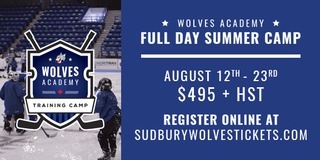 The Wolves battled hard at the beginning of the second to get themselves back in the game and a goal KYLE CAPOBIANCO tied the game at 2. The goal was followed by three unanswered goals from the 67’s as CHASE CAMPBELL, ARTUR TYANULIN and JARED STEEGE all scored, sending them into the intermission up 5-2. It was bad news for the Wolves as KYLE CAPOBIANCO was given 5 minutes and a game for interference after a hit on KEATING. It was a hard fought third period by the Wolves but they could not beat Ottawa goaltender, LEO LAZAREV. LIAM DUNDA had some great chances with one shot just trickling along the 67’s goal-line. With four minutes left in the game, JARED STEEGE scored for the 67’s to increase their lead to 6-2. That would do it for the Wolves as they fell by a 6-2 final. Shots on goal at the end of the game were 56-35 in favour of the 67’s. BOWMAN made 50 saves in the loss and was named third star of the game. 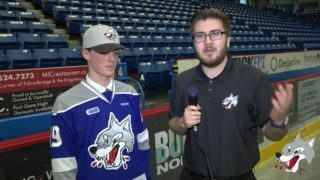 The Sudbury Wolves will look to rebound next Friday night when they are home to the Oshawa Generals at 7pm. This game will be sponsored by Enercare.